Adventures and stories from Canada's Western Arctic, told by three aspiring sketch comedians. 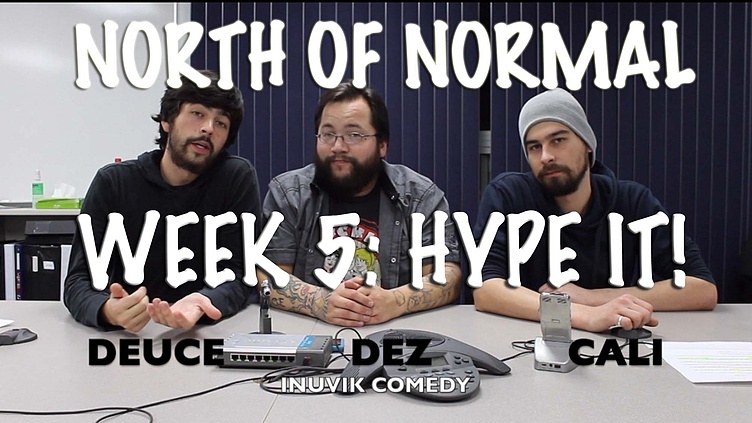 North of Normal is a sketch show by Inuvik Comedy. We're the only northerners in ComedyCoup and we want to get the attention of the media from across the Country. We're walking headlines and a sure-fit for top news story every night. Our sell sheet is designed to promote our team and our product to the media and anyone who hasn't seen us online. The North of Normal team is hosting our first event! "Chill and Chili" where we are inviting the public to come out and learn more about ComedyCoup and Inuvik Comedy! Prizes, draws, our videos and most importantly, we will help you set up an account with ComedyCoup online! 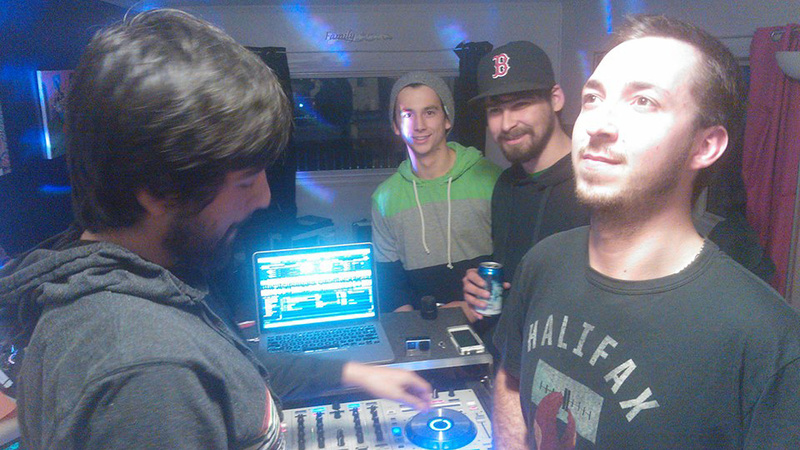 We got our friend Friday Face (far right) to DJ our party that spanned three days! 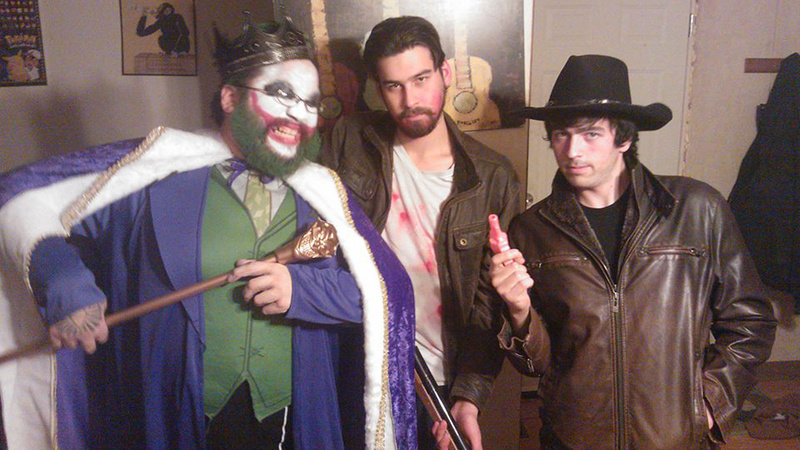 Dez was the JoKing, Cali was Rick Grimes and Deuce went as Carl from the Walking Dead! I will not be voting for these guys project because I think How To Do Everything Gooder is the best show CBC could choose to air! Is this 100 characters? lol thank you for the comment and we hope to see HTDEG in the Top 15! Represent! Interested in seeing where you take it in future weeks guys. You have causght my attention and will keep an eye out for you guys! Nice relaxed screen presence from each of you. I didn’t laugh out loud at this one, but I would like to hear more from the North in one way or another! Well you guys are pretty hyped up! Congratulations on getting this far and all the best to the team with pushing forward to to top fifteen! Good luck with the rest of the competition and stay warm in the great north, eh?!!! Right on eh! Wow - Top 55! Next on to Top 15! Liked your Hype video - I bet this idea can really keep forming - you all seem funny and yet nice and genuinely eager to make others laugh. Keep up the great work - and never silence the dream! I am super impressed by you guys. You really don't let your isolation impact the strength of your art. I like your attitude and think you're really funny. Hope you had fun with mission 6 and I'll check back in this week to see what you made! Ryan G. this comment made my day! Thanks man, we had a great time shooting mission 6! You remind me of the kind of guys I used to hang out with in highschool. That small town, Canadian charm is what's going to take you guys far. A big plus for you guys is being from Inuvik, which for a lot of Canadians is more alien than places on the other side of the planet like Sydney or London. That unique take on comedy is what I'm looking forward to in your next videos. I hope to see you in the Top 15! Props to you guys for being funny, likeable and genuine! Happy to see that you advanced to the top 55 and I hope to see you in the top 15! keep it up guys. looking forward to seeing more from these creators. Love the authentic north! Great seeing comedy from the north, but this could have been more entertaining. Plus you guys had time to party after the top 55 selection? lucky. Congratulations on making it to the top 55! I truly hope you make it to the top 15 and beyond. You all have so much potential. I think a show from the north by northerners will interest a lot of Canadians. Best of luck! That is amazing, thank you for the nod!! Yes it would be nice to see a comedy made in the north by northerners. This the first video I have seen of yours. Don't know if you are ready for prime time TV. I will check out more of your work. Good luck. Your crew is so personable, and clearly funny ! I've enjoyed all of your videos, and especially like that you're from the true North part of this big nation. That may be your strongest point, because as a former Northener myself, I know that you have a treasure chest of unique experiences to turn into comedy gold. Keep up the funny! Congratulations on making it to the Top 55 and good luck on making it to the Top 15!! Northerners unite! We gotta stick together out there! My votes are here! Seeing that there haven't been other shows made by comedians in this part of our country, I think they could offer a really unique perspective, which is always a good thing! i know this has already been said before but i really just love the locale so much. we need to see greater representation of canada's diversity in mainstream media and your show is an excellent opportunity for that. im on board. You seem like a cool group of people and this is a cool concept. I'm a big fan. Hope to see you in the top 15! Three great funny guys, but I am really looking for a series with a sense of story and characters we can get to know, and sketch comedies have a hard time doing that. Some end up being fantastic and lasting for many years, but the majority of sketch shows can't get out of the first season. Congrats, you're project really stands apart and I enjoy that it's a comedic celebration of a part of Canada that so many of us know so little about. "By the North from the North" - I love it! Yes show us what's goin on up there! You all have a lovely genuine quality about you that is comfortable to watch. Enjoyed the vid. Congrats on making the top 55 and I will keep my eyes peeled for more content. Bring it on, Inuvik! ;-) j.
I love that you are a voice from the North. So many Canadians know so little about your part of the country. You guys could really share unique experiences. I dig it. Glad to see a northern (waaay northern) community represented here. I am a late follower of yours, so unfortunately your video didn't tell me anything about your concept. Good job on the Week 5 video guys. Have been watching you since the start and enjoyed the enthusiasm of your team and family. Must be a little harder to shoot outdoors now so as to keep the snow off the camera lens. Quite the enthusiastic ensemble. I like that the humour isn't too over the top. The concept is pretty good. I believe the hype yo! North of Normal and anything but. Keep the rad ideas flowing. My votes are elsewhere, but I'll be following you guys for sure. Rock on with your hockey socks on! Love the title, love the passion, love the serious talk punctuated by stealing a little girl's cake. I hope you guys stay with this idea even if you don't make it into the top fifteen. Great job eh! I love the name North of Normal! You could do a spoof on the double rainbow guy with the Northern lights! Love the passion on display here. Love the sly dig at North of 60, too! Even though I'm Albertan! You guys are unique, genuine, and funny! Hope to see you go far regardless of your progress in the accelerator. Good luck! Congrats on making it to the top 55 and representing Northern Canada. It is definitely true that Canadian television is seriously lacking in this department. Having said this, I do wish that you guys took a more creative approach to this video. Good luck! Nice job on the video guys.. true north strong and free! You fellas are obviously pretty passionate and it shows in your videos. Nice to see some representation from our northern territories.. all the best form the east coast, and hope you guys make it into the top 15! Good job on the Week 5 video guys. I thought Prince George was pretty far north which is where we have been filming most of the "Geoff and The Ninja" entry. However you guys definitely are much much farther north. What are you using to shoot on up there? Will be a little harder to shoot outdoors once the snow hits. Keep them coming and good luck getting in the top 15! One of the great things about this competition is that we're getting to see what talent there is in this great big country. Good luck to you guys. Good luck. You have worked very hard and comedy coup has a big debt to pay to all the teams that participated. Wow, nice going! This looks like fun!!! Go North go! Only team form the North; that is great! You guys have worked hard to make it so far. Hope to see more laughter in week #6, and more of what you are and where you are going with your project. Good luck from the Interior! I feel that you guys have lots of potential and it's great to see that there is a team from the north still in this competition. Good luck on your progress in this competition. Good to see you guys made it so far. It would be interesting to see some comedy from up north but not sure if it's too region-specific to be funny for the rest of Canada. Good luck to you! OK, I like the unique voice that you bring to this collection of Top 55 sitcoms! It *would* be great to have a true north show, written and performed by people in the region. Congratulations on making it this far, and may you advance even farther! Right on, love the last statement! Way to go guys hope the votes pile up, you've got all mine!! Anxious to see everything you guys have in store, pulling for you all to make it far!! I love the name of the show and think that it is high time this country had some comedic representation from the Territories! Bravo for your efforts and I hope you get the vote out to continue to the next level. Nice stuff on this weeks challenge. some funny stuff here. congrats on making it this far and best of luck in the next round. Still like you kids from up north! A cool perspective and hype video and I am in all the way baby! ALL THE WAY! Very cool that you're representing a place very few Canadians get to. Congrats on making the top 55, and I wish you lots of luck for the top 15! every week I am hoping you guys will progress further and further. You are really talented and hard working and your idea is great. Best of luck! You just made my day! Thank you for that! Rooting for you guys! I think next week is going to be a tough one for all the sketch comedy shows. Looking forward to seeing what you guys put forward! Best believe we have a plan! Thanks Max! We're gonna #beTotesCray and see where that gets us. It's great to see a team from such an unexpected place doing so well. Gratz on making it to the top 55, and good luck with the next round. It looks like you're having a great time doing it. Thanks Ryan! We are having a blast! It's been a tremendous learning experience and we have so much more coming out of it. The teams from the more remote areas of the country are doing Great in my opinion! You are one of these! Hope to see you in the Final 15! I liked the video - would have liked to see a bit more out of that room - but still a great job hyping the North. I really like seeing teams from the smaller communities of the country and hope the winner comes from an under repped area. you guys are so awesome. Every time I watch your videos I root for you more and more. I hope the rest of the competition goes well and your sell sheets are good. Thanks! It means a lot to read comments like this. heck, any comments are GREAT!! Looks like you guys are having a fantastic time making these videos and projects. Telling like it is up north with the winter fast approaching. Cute kid! Good luck in the next round. Everything's tougher in the north, including getting the numbers to move on, which you've done so far. Clever ending to your HYPE video, brrrr, made me shiver as things just got a whole lot colder. Good luck with this next round of voting. This is awesome. I really love the representation from the North here. I'm excited to see more. The shout-outs to the other tams who didn't make it this far was not only genuine and nice but also VERY Canadian. Great representatives of our country. Thanks Brian! We're trying our darndest and with the help of those around us, we can make the top! i like watching your videos they are really well done. you guys are inspiring and very talented. You also seem like a really cool bunch. I hope you succeed and I wish you the best. You guys are very cool. See what I did there? (Ice Cold? North? Oh yeah.) Just seeing your video now - love your team name and your sincerity - very classy to shout-out to your former contestants. Way to represent the North - Best of luck! Always cool to see voices from different parts of Canada and different segments of culture creating! HAHAHA! YES! You guys are so awesome and enthusiastic! It gets me every time! Congrats on making the top 55, and best of luck with the top 15! Also, loved the cake. She looked so sad. But it still made me smile. You guys are very personable and likeable! I also was wondering what that spaceship thing is on the desk. Just made me think of Star Trek...and that show was awesome. See you in the top 15! Glad to see North of Normal is still in the mix! Next challenge you need to show us more of what you can do and what the focus of your show will actually be ... I will definitely be checking out your next assignment! If you guys didn't already have the name "North Of Normal" chosen, that's definitely how I would have described you. Your quirkiness is a great asset, so please, keep it up! Amazing work from the north as usual. I would like to see more of your concept in the future, not just because I find it entertaining, but I also enjoy seeing what it's like up there in the north. Chilli and bannock event, don't get much more northern then that. I would offer caution in relying too heavily on we are from the north sale. It is important, but keep showing the other stuff, your strong comic talent. The cake scene was priceless fumiest home videos slant thrown into the mix. The skits are your strong suit. Watch the language, the Fbomb at the end, not necessarily CBC content. Good luck with this. More scenes from the North itself.... and the homes and lifestyle. you made me beleive that you are sincere in your work and beleive in your project.You love the north and your a loyal to it keep up the good work and wish you the best. Great video guys. Also congratulations for the 3 press articles. You guys seem to be doing really well and I hope to continue to see you throughout this competition. There needs to be somebody to represent the north. Scooping the cake from the kid. Getting a whole lot colder. Love it. You guys are holding your own looking good. Nice hyping of the Canadian north angle, got to keep it front and center. Good luck to you. You guys seem nice and at least you have a good "hook" -- go north go! Good job guys! I like the video and the sell sheet! Keep it up... and I don't know how you managed to get Dave Grohl in the video, but nicely done. Ha ha ha, and by that I mean dude on the left looks just like Dave Grohl! you guys are really likeable and I am routing for you! sell sheet has good images but may be a bit wordy. Dez, love the almost wrestling promo you cut. Shows your fandom without being over the top. Much love bro. Guys I like the fact that you are sincere and newcomers man. We at Wasted support you brothers. Your teaser was enjoyable and you guys seem sincere. I am not sure that it is enough to keep me watching week to week. Good luck. Good luck guys! Been to Inuvik, saw the igloo church and the 3 ply daily paper. Glad stuff is going on there. While some lines are funny, I think the concept would fade very quickly so I don’t think I could watch this week after week. This ain't no North of 60 alright and, I'm glad! Well you guys are genuine that's for sure. You are from the North and you love the North, that transpired in your video. And you are the one team from up there! Bravo! Good luck with your project and with Chill and Chil! Your team made some good points, such as being uniquely & authentically "Northern". Cool(Yeah, I went there). I would have likee to have seen a bit more of the wit and comedy that you talked about, in this 'Hype It' episode, though. Good luck, and may your popularity carry you on to the next level. stay proud guys, you represent 1,304,903 sq. mi.! (1,511,979 sq. mi. if you include Yukon!) In addition, the easternmost and the westernmost points in the country. (sorry Nfld & B.C.- check the longitude of NE Ellesmere and that of the western border of Yukon) An area waaaaay bigger than the Vatican!!! If I had the time and money, I would fly north, grab a big hug from you three, a great big bowl of chilli and chill you all. I wish I could go up North, and see just how un-normal things are. You guys are doing a pretty good job of showing me, but I'm more of a tactile learner, I suppose.